Doing more with much less, British pilots at this year’s Icarus Cup follow in Paul MacCready’s aerial path, staging a highly successful weeklong demonstration of human-powered flight. Airplanes that fly on about a quarter-kilowatt for as long as the human battery can operate the pedals are not new, and significant records have been achieved over the years. The British have long been involved, beginning with the 590 meters flight by Derek Piggott on November 9, 1961 in SUMPAC (Southampton University’s Man Powered Aircraft – note the sexist terminology of the day). This was considered the first authenticated takeoff and flight by a human powerplant. He made 40 flights before suffering a crash that damaged a wing. To help foster interest in human-powered flight, The Royal Aeronautical Society formed the Man Powered Aircraft Group in 1959. Henry Kremer, an industrialist, set up the Kremer prize for a figure-of-eight flight around two markers half a mile (~0.8 Km) apart in 1959. It took 18 years for Brian Allen, pedaling Paul MacCready’s Gossamer Condor to win that prize. Two years later, he guided the Gossamer Albatross across the English Channel, winning the Cross Channel Kremer Prize. Others have since flown even longer distances, but the sport has struggled in Europe and America for the last several decades. 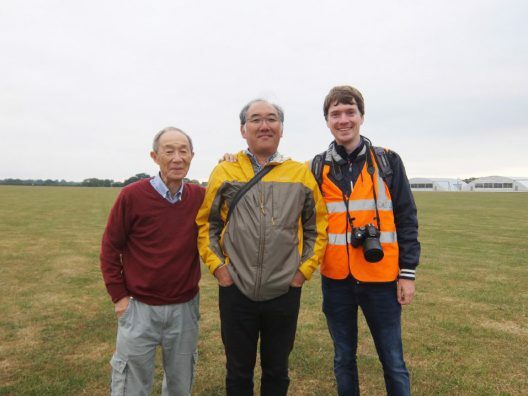 The Japanese have created a fairly thriving group of builders and pilots who are approaching the cross-channel distance records. An international competition might bring money and enterprise into sharper focus. Emulating last year, four teams showed up, but only two actually competed – but fiercely. Nial Paterson flew the first successful HPA figure of eight in Britain, going around the course one and a half times before making a great landing. As the video-maker notes, “This isn’t just the first time this flight has been flown in the UK, it’s probably only the second or third time a full figure-of-eight has been flown in any HPA anywhere in the world.” In other words, it’s harder than Niall Paterson makes it look. Winning scores went to the newer Aerocycle 103 and the Airglow, an “experienced” HPA flying since 1989. Individual pilots racked up points flying the two competitive machines. One remarkable (to this editor) achievement was 11 reversals in a 500 meter (1,640 feet) slalom event. This shows a level of control perhaps as tough as that required for the figure of eight. 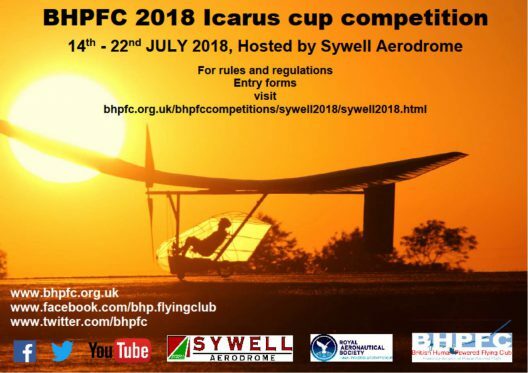 The RAeS Icarus Cup Trophy results for pilot performance at the BHPFC Sywell Competition 2018. 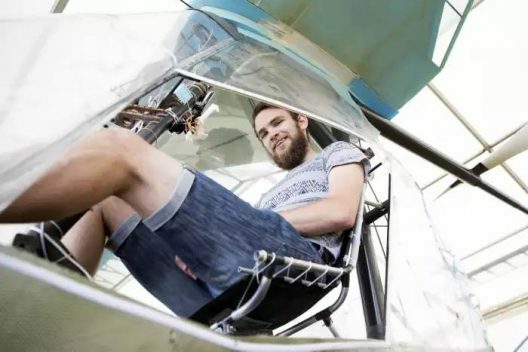 Further afield, a newspaper in Washington state headlined, “Local couple’s nephew part of ‘Icarus Cup’ competition.” Karen and Clay Parsons’ nephew is Alec Proudfoot, designer of the DaSH Project PA, which has flown at Half Moon Bay and Moffett Field, California. Heading the Aerocycle 301 team, he carried America’s capabilities to England. The (Wiltshire) Gazette and Herald added information about Aeroglow’s designer. 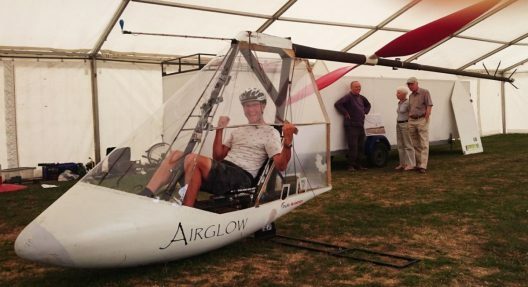 “John, of Huntingdon Street, Bradford on Avon, said: ‘This is a fascinating event trying to get a human-powered aircraft to take off and fly in multiple challenges for the trophy. “‘You have about five seconds to get a feel for the controls and the aircraft response, then fly it with minute control, compensating for wind changes, all the while pedaling at your absolute maximum power output. “‘The aircraft is incredibly unpredictable and vulnerable to any changes in wind speed and direction and you have to make split-second decisions. “‘You control the aircraft with a tiny electronic joystick, while making judgments and pedaling furiously to the limits of human endurance. With an American win this year and a creditable performance by a 30-year-old second-place winner, one wonders if the inclusion of Japanese teams would bring greater recognition and the aura of worldwide competition to the event. Thanks to Fred To for his contributions to HPAs, and to Chris Roper for his ongoing chronicling of these fantastic machines. Fred has ties to a Japanese HPA follower who might be able to help make next year’s event truly international.